This entry was posted on August 16, 2018 at 11:58 am and is filed under Cute Problems, mathematics with tags geometry, mathematics, triangles. You can follow any responses to this entry through the RSS 2.0 feed. You can leave a response, or trackback from your own site. It’s equal to the difference in triangle heights. Take three circles of different sizes. For each of the three pairs, construct two tangents to both circles. These will intersect at some point. The three points of intersection are always collinear. I couldn’t resist this problem, and didn’t find it easy. It was obvious that you could slide the lines around to align with the centre of the small triangle. Thus if the sum of the lengths to any point within the big triangle was S (i.e. infinitesimal inner triangle) then S must scale as the base of the triangle, so the answer is S (1-B_small/B_big). But what is S? I admit I wrote it out as a problem in vector calculus, and eventually got S=B sqrt(3)/2. So indeed S is the height of the triangle, and there must be a neat way of seeing this. If only I’d read Euclid more carefully at school…..
Was I supposed to know that theorem? Maybe you had a more classical maths education. I went through school at the height of the SMP revolution, when the first thing they hit you with on day 1 as an 11-year-old was matrices. I think I’m glad about this on balance, but there were clearly negatives to the SMP approach, which is why they don’t do it like that any more. Cute indeed! 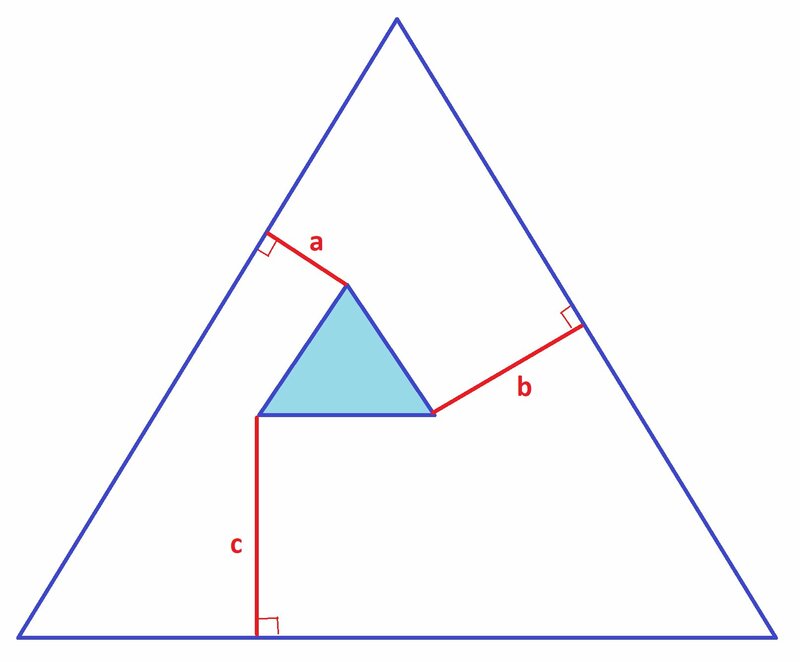 My solution skeleton: look at the unit vectors pointing from the corners of the small triangle along the segments a, b, c. Call them A, B, C. When the small triangle moves with velocity V, the lengths a, b, c decrease at the rates A⋅V, B⋅V, C⋅V. The vectors A, B, C, though, stay the same—and they always sum to zero.